FLAGSTAFF, Ariz. — Uninspired by modern art, Kurt Wenner set out to learn how European masters made architecture soar and figures float in ceiling frescoes. What started off as two-dimensional chalk and pastel art on the streets of Rome decades ago, mimicking what Wenner saw in Renaissance classicism, morphed into an art form of his own – one that makes objects appear to rise from or fall into the ground in three-dimensional pieces. His latest piece unveiled just outside the Grand Canyon has visitors perched atop spires and starting down a winding trail that seemingly plunges into the depths of the massive gorge. 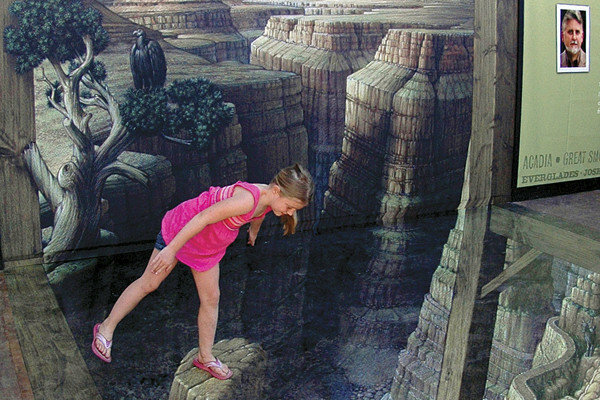 The piece, “Grand Canyon Illusion,” certainly is puzzling to the eye, blending the visitors who pose in it with a scenic, infinite backdrop. It’s the first semi-permanent display of Wenner’s work in North America and one that he hopes will help take pavement art to a higher level. The Grand Canyon artwork, which is on display through October at the National Geographic Visitor Center in Tusayan, near the South Rim of the park, spreads over the courtyard floor and up one wall. The three-dimensional illusion works best when viewed from one corner, where a vertical beam gives a visual cue to make the illusion pop. Wenner put about 150 hours of work into it, after being contacted by National Geographic and Nature Valley – two of his previous clients. He typically does about a dozen jobs a year out of hundreds of requests because of the scale and time each piece takes. The hardest part of portraying the Grand Canyon was conveying the vastness of the gorge, which doesn’t carry through in photographs, he said. Unlike the sidewalk drawings that Wenner helped popularize around the world, this piece won’t wash away with the weather. By first creating it with pastels, transferring it to digital art, then printing it in sections before laying it out at the National Geographic center, it’s better preserved for public view. Wenner left his job doing technical illustrations of spacecraft and planets for NASA after two years and traveled to Europe to further study an art form he had only broached in art school. He was inspired by Roman ceilings from the 17th century, but he had to figure out how he could apply classical art techniques to a surface closer to the viewer. What resulted was a new geometry that helps Wenner break down figurative walls between the art and the public. With each drawing, he tries to include three elements with which the public can interact. His last two pieces were displayed in Singapore and in Chile. Wenner moved back to the United States after living in Italy for 25 years, where it’s common for street painters known as madonnari to live off the donations of passers-by. Wenner helped revive and popularize the art form in street painting festivals around Europe and the United States. GRAND CANYON ILLUSION: National Geographic Visitor Center, Tusayan, Ariz.; http://www.explorethecanyon.com or 928-638-2468. Free. Art on display through Oct. 31. Visitor center open from 8 a.m. to 9:30 p.m. daily (all times MST). Near the South Rim of the Grand Canyon, located 1.5 miles (2.4 kilometers) from the entrance to the park.